This week Trump released his latest budget for 2019-20 fiscal year. It calls for $2.7 trillion in various social spending cuts over the decade, including $872 billion in reductions in Medicare, Social Security, Disability spending; another $327 billion in food stamps, housing support, and Medicaid; a further $200 billion in student loan cuts; and hundreds of billions more in cuts to education, government workers’ pensions, and funds to operate the EPA and other government agencies. Not surprising, the $2.7 trillion in social program spending cuts will finance spending for the military and defense related programs like Homeland Security, Border walls, veterans, police, and programs like school vouchers. Of course, the budget proposal is ‘dead on arrival’ with the US House of Representatives, which must approve all spending bills, according to the US Constitution. But don’t hold your breath. Trump may now have a back door to this Constitutional obstacle and eventually get his way on the budget, at least in part, to fund his military spending plans. It should not be forgotten, Trump just enacted his ‘national emergency ’ to build his Mexico border wall by diverting funds, without Congressional approval, from other sources in the US budget—i.e. a clear violation of the US Constitution. That ‘national emergency declaration’ will almost surely be approved by his current stacked US Supreme Court before the end of Trump’s first term. When approved, the precedent will allow Trump to repeat the action, perhaps on an even larger scale. So what’s to stop him from using the same national emergency precedent to shift other funds in the future from social programs to the military and defense, as he clearly proposes in this latest budget? Some liberals and Democrats may declare he can never do that. But they said the same about his national emergency declaration to fund his wall, and he declared it anyway. He will continue to subvert and destroy long-standing rules and even Constitutional norms within the government. The national emergency declaration about funding his wall gave him his foot in the door. Will the Supreme Court eventually allow him to kick it open now in the future? One shouldn’t be too surprised with this President, who has little concern or respect for Democratic rights and institutions. We now have a precedent in the national emergency declaration. So what’s to stop him from shifting even more funds from social programs to war, defense and the military? In other words, to spend a good part of his proposed additional $2.7 trillion for the Pentagon, and to simply divert the funds from Medicare, Social Security, Education, etc.? The Democrat Party majority’s control of the US House of Representatives’ may refuse to pass legislation to approve Trump’s $2.7 trillion budget shift to the military and defense. But the precedent now exists allowing him to do it. Trump is intent on getting what he wants, to pander to his right wing base, and get himself re-elected. He cares little for Democratic norms or civil liberties. Don’t underestimate his willingness to shred those liberties and subvert those norms. As worrisome as the politics of the US budget process going forward may yet prove to be, however, the economics of Trump’s 2019-20 budget are more serious. It represents a trend that will continue whether or not the budget is passed, either in the short or the longer term by national emergency declaration. Whether Trump’s budget is passed or not, his fiscal policy (taxation and spending) already represents a faster escalation of US deficits and therefore Debt. During Trump’s first two years in office, US federal government deficits have driven the national debt up already by $3 trillion: At the end of 2016, when Trump entered office, the US national debt was $19.5 trillion. Today it is $22.5 trillion. He’s thus already added $3 trillion, a faster rate per year of debt accumulation than under even his predecessors, George Bush and Barack Obama. The Treasury Advisory Committee, a long standing committee of private experts who regularly provide advice to the US Treasury, recently warned the US Treasury that it will have to sell $12 trillion more US Treasury bonds, bills and notes, over the next decade if the US is to fund the $1 trillion plus deficits every year that now coming over the next decade, 2018-2028. That’s $12 trillion on top of the current $22.5 trillion national debt! That’s a $34 trillion national debt by 2028! According to the Congressional Budget Office research, that $34 trillion national debt will translate into no less than $900 billion a year just in interest payments on the debt by 2028—a roughly tripling of interest payments that will have to come out of future US budgets as well, in addition to escalating tax cuts and war-defense spending. How will the US government pay for such escalating interest—as it continues to cut taxes for business, investors and the wealthy while continuing to accelerate war and defense spending? The US government’s growing Deficit-Debt problem did not begin with Trump, however. He just represents the further acceleration of the Deficit-Debt crisis. Trump’s escalating deficits and debt are driven by two main causes: tax cutting and defense-war spending increases. But this is just a continuation of the same under Bush-Obama. Studies show tax revenue shortfall accounts for at least 60% of US deficits. Another 20% is due to escalating defense spending, especially the ‘off budget’, so called ‘Overseas Contingency Operations’ (OCO) budget expenditures that go for direct war spending. The OCO is in addition to the Pentagon’s official budget, now to rise to $750 billion under Trump’s latest budget proposal. The US actual defense budget, therefore, includes the $750 billion Pentagon bill, plus the OCO direct war spending. Total defense-war spending also includes additional ‘defense’ spending for Homeland Security and for the CIA’s, NSA’s, and US State Department’s growing covert military spending for their ‘private’ armies and use of special forces. It further includes spending for Veterans benefits and military pensions, and for the costs of fuel used by the military which is indicated in the US Energy Dept. budget not the Pentagon’s. Add still more ‘defense’ spending on nuclear arms billed to the Atomic Energy Agency’s budget. And let’s not forget the $50-$75 billion a year in the US ‘black budget’ that fund’s future secret military arms and technology, which never appears in print anywhere in the official US budget document and which only a handful of Congressional leaders in both the Republican and Democrat parties are privy to know. In short, the US ‘defense’ budget is well over $1 trillion a year and is rising by hundreds of billions a year more under Trump. US wars in the Middle East alone since 2001 have cost the US at minimum $6 trillion, according to various estimates. But contributing even more than wars to the now runaway national deficits and debt is the chronic and accelerating tax cutting that has been going on since 2001 under both Republican and Democrat presidents and Congresses alike—roughly 80% of which has gone to business, investors, and the wealthiest 1% households. When George Bush took office in 2001 the national debt was $5.6 trillion. When he left it was approximately $10 trillion. A doubling. When Obama left office in 2016 it had risen to $19.6 trillion. Another doubling. (Under Trump’s first two years it has risen another $3 trillion). 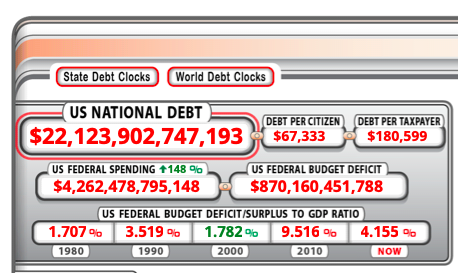 For a US national debt of $22.5 trillion today. Under George W. Bush’s 8 years in office, the tax cutting amounted to more than $4 trillion. Defense and war spending accelerated by several trillions as well. The middle east wars represent the first time in US history that the US cut taxes while raising war spending. In all previous wars, taxation was raised to help pay for war spending. Not anymore. Obama cut another $300 billion in taxes in 2009 as part of his initial 2009 economic recovery program. He then extended the Bush tax cuts, scheduled to expire in 2010, for two more years in 2011-12—at a cost of another $900 billion. He further proposed, and Congress passed, an additional $806 billion in tax cuts for business as the US economic recovery faltered in 2010. Obama then struck a deal with Republicans in January 2013 to extend the Bush tax cuts of 2001-08 for another entire decade—costing a further $2 trillion during Obama’s second term in office (and $5 trillion over the next ten years, 2013-2023). Thus $2 trillion of that further $5 trillion was paid out on Obama’s watch from 2013-16 as part of the 2013 ‘Fiscal Cliff’ deal he agreed to with the Republicans. So both Bush and Obama cut taxes by approximately $4 trillion each, for $8 trillion total. And defense-war spending long term costs rose by $6 trillion under both. When added up, Bush-Obama 2001-2016 combined $6 trillion in war-defense spending hikes, plus their accumulated $8 trillion in tax cutting, roughly accounts for the US federal deficit-debt increase of $14 trillion, i.e. from $5.6 trillion in national debt in 2000 to $19.5 trillion by the end of 2016. To this Trump has since added another $3 trillion during his first two years in office, which adds up to the current $22.5 trillion US national debt. In January 2018 the Trump tax cut provided a $4.5 trillion windfall tax reduction over the next decade, 2018-2028, targeting businesses, multinational corporations, wealthy households, and investors. US multinational corporations alone were allocated nearly half of that $4.5 trillion. So where did the 2018 Trump (and continuing Bush-Obama tax cuts) go? Several bank research departments in 2018 estimate that in 2018 alone, the first year of Trump’s tax cuts, that the S&P 500 largest corporate profits were boosted by no less than 22% due to the tax cuts. Total S&P 500 profits rose 27% in 2018. So Trump’s tax cuts provided the biggest boost to their bottom line. Not surprising, with $1.3 trillion in corporate stock buybacks and dividend payouts occurring in 2018 as well, US stock markets continued to rise and shrug off corrections in February and November that otherwise would have brought the stock market boom to an end. But starting this year, 2019, the middle class will begin paying for those corporate-wealthy reductions. Already tax refunds for the average household are down 17%, according to reports. The middle class will pay $1.5 trillion in higher taxes by 2028, as the tax hike bite starts in earnest by 2022. Another $1.5 trillion in absurd assumptions by the Trump administration about US economic growth over the next decade supposedly reduces the Trump’s $4.5 trillion of tax cuts for the rich and their corporations by another $1.5 trillion. Thus we get the official reported cost of only $1.5 trillion for the 2018 Trump tax cuts. But the official, reported ‘only’ $1.5 trillion cost of Trump’s 2018 tax cuts is the ‘spin and cover-up’. Corporate America, investors and the wealthy 1% actually get $4.5 trillion, while the rest of us pay $1.5 trillion starting, now in 2019, and Trump spins the absurd economic growth estimations over the next decade. The 2018 Trump tax cuts have reduced US government revenues by about $500 billion in 2018. Add another $.5 trillion per year in Bush-Obama era tax cuts carrying over for 2017-18, another $.4 trillion in Trump war and other spending hikes during his first two years and more than $.6 trillion in interest payments on the debt—and the total is a further $3 trillion added to the national debt during Trump’s first two years. So Bush-Obama add $14 trillion to the $5.6 trillion debt in 2000. And Trump adds another $3 trillion so far. There’s the $17 trillion addition to the $5.6 trillion national debt. And now, according to the Treasury Advisory Committee, we can expect a further $12 trillion in debt to be added to the national debt over the coming decade—to give us the $34 trillion and $900 billion a year just in interest charges on that debt! But it gets worse than another $12 trillion. Today’s $22.5 trillion, rising to $34 trillion, is just the US national government debt. Total US debt includes state and local government debt, household debt, corporate bond and business commercial & industrial loan debt, central bank balance sheet debt, and government agencies (GSEs) debt. Household debt is now $13.5 trillion and rising rapidly for student loans, auto loans, credit cards and other installment loans. In 2018, State and Local government debt was $3.16 trillion and rising as well. Corporate bond debt today is more than $9 trillion—two thirds of which is considered ‘junk’ and low quality BBB investment grade bonds, much of which is likely to default in the next recession. To this must be added other forms of business loan debt, commercial paper, and the like. The Federal Reserve bank’s balance sheet is also a form of debt, which is $4 trillion and, according to the Fed recently, will not be reduced further. Other government housing agencies, like Fannie Mae, add hundreds of billions more in US debt. All these account for more than an additional $30 trillion in US debt. Add these other forms of debt to the national debt of $22.5 trillion and the total debt in the US rises easily to around $53 trillion. And add the further $12 trillion additional national debt on the horizon and further increases in other forms of debt, and the total US debt may easily exceed $70 trillion by 2028. The $900 billion a year in interest charges assumed by the CBO may thus be actually too low an estimate. Who Pays the Debt and to Whom? To whom do the various interest payments on debt accrue? To the wealthy and their corporations who buy the US and corporate bonds and who issue the credit cards, auto loans, and mortgages; to their banks that offload their debt to the Federal Reserve central bank during financial crises and recessions; to wealthy investors who buy government and agency bonds; to wealthy shareholders who have been getting $1 trillion a year since 2009 in dividends payouts and capital gains from stock buybacks made possible in large part by corporate bond raisings; and to wealthy households and corporations that get the tax cuts that drive the deficit and debt. Their ‘interest income’ is projected to continue to accelerate over the next decade, thus further exacerbating income inequality trends now plaguing the US and getting worse. Policies accelerating debt-based income transfer since 2001 have been expanding and deepening since 2000, across both Republican and Democrat regimes, from Bush through Obama, now accelerating even faster under Trump. For consumer and household debt, clearly the working class-middle class pays most of the interest on the debt—via mortgage, auto, student and credit cards, rising state and local taxation, more federal taxation paying for the Trump tax cuts, etc. The federal government—and thus the taxpayer–pay the interest on the government bond debt. The creditors and owners of the debt reap the benefits, now in the trillions of dollars annually. The Trump budget proposes to pay for the US government’s share of the total debt, by transferring the cost of financing military-defense spending and tax cutting—which creates more deficit and debt—to those households who aren’t investors and business owners. But whether Trump gets his budget approved or not is irrelevant. The deficits and debt will continue to accelerate nonetheless. And if he does get to shift some of the cost via extending his national emergency rule to the US spending in general, not just his wall, the economic consequences will of course even be worse. Conservatives argue that this excludes rising social program spending debt, like social security and medicare. But those programs are not financed out of the US budget (with the exception of the prescription drugs program for seniors). They have their own tax base, the payroll tax. What about the 2008-09 bailout? The banks were bailed out by the Federal Reserve not Congress. And the costs of social program spending hikes after 2008-2011, were offset by a $1.5 trillion cut in social spending that started in August 2011—which exempted effectively cuts in defense spending thereafter. The most worrying thing about the debt explosion is the apparent lack of concern among the political class. This used to be daily grist for think tanks and politicians alike, but is almost as though they have come to an understanding – a massive sell-off of what remains of the commons, from the Federal level to the local. The debt is unpayable already, ripe for a Hegelian Dialectic approach. The final step in complete corporate takeover of democracy, and its coming soon. Other than as an indicator of suicidal inequality and a huge transfer of wealth from the Commons and the lower 95% of the people to the top 1%, the ‘debt’ is irrelevant. The debt is one of the best indicators of the extent of the thievery of the 1%. It is also indicative of just how much of our GNP is wasted. Good Monetary and Fiscal Policies will ultimately balance a nation’s credit (aka debt) with it’s expenditures (aka, money supply). A key indicator of economic health is the velocity of money, which indicates that people are able to pay their bills efficiently. “A key indicator of economic health is” is how many years we have until Mother Nature’s backlash to 200 years of burning fossil-fuels resulting in AGW/Climate Change begins killing people by the millions. I couldn’t agree more. However, that concept is so foreign to the movers and shakers in the world (read: the elite and wealthiest) and their hangers-on, that it may be too abstract to make much of an impact on the choices we all must make. Most human beings seem to have the attention span of flies and the limited vision of earthworms.